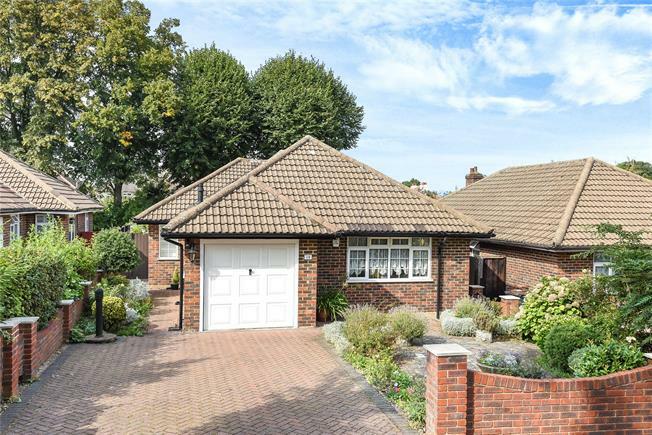 2 Bedroom Detached Bungalow For Sale in Croydon for Offers in excess of £530,000. Chain Free. Delightful two bedroom detached bungalow in a sought after location. This charming property is well presented and offers bright and spacious accommodation and briefly comprises; entrance hall, light and airy reception room measuring 19'10 x 16'9 with feature fireplace and doors out to garden, a modern fitted kitchen opening to a dining room, a family bathroom, separate wc and two bedrooms. Externally the well maintained rear garden is secluded, has a raised decked patio area, flower beds, an array of mature shrubs, two sheds and a garage. To the front of this bungalow there is a driveway with off-street parking. Farm Drive is conveniently situated close by local shops, bus routes to Bromley and Croydon and is accessible to West Wickham High Street with all its amenities and West Wickham Station. Viewing recommended.